No Account? Register with us. OUR PRICE: $19.13 - Join Rewards Get $1 Dance Dollars On This Item! 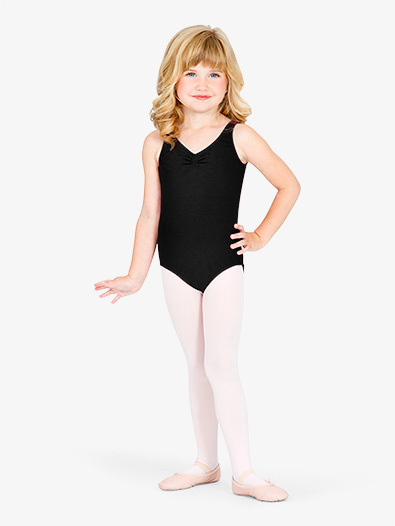 This child tank leotard by Bloch features a pinch front, low gathered back, and a ballet cut leg line. Chest 20"-21" 21"-23" 25"-27" 27"-29" 29"-31"
Waist 18"-19" 19"-21" 22"-23" 23"-25" 26"-28"
Hip 21"-23" 23"-25" 27"-29" 29"-31" 31"-33"
Girth 32"-35" 36"-39" 44"-47" 48"-51" 52"-55"
Inseam 18"-20" 20"-22" 24"-26" 26"-28" 28"-30"
This information is shown as a guide only and not a guarantee. Do you think your friend would like to know that DDS has this item? Just fill in the following information and we will let them know! Yes! I would like to receive e-mail from DDS about upcoming sales, new products, and catalogs! Your friend's e-mail address will not be added to this list. Leave yourself a note about this style, you can even tweet it to your followers! All of your notes can be viewed or edited from your account page. My daughter's favorite leo! She likes tanks vs. halters or camis and this one fit her perfect. The little gathers in the front and back make it just a tad bit cuter than the standard tank leo. Fit perfectly, made of heavier cotton. Bloch black leos do fade after a few washes (thus the 4 stars for durability), but she is required to wear black. Otherwise, great buy! My daughter loves this. It is very comfortable and looks great, too. It is very well made (great material) and I know it will last a long time. Ordered one for each of my daughters and they fit great and are very comfortable. Can't go wrong - priced nicely too! This leo is so cute. I usually do not care for tank style leos, but this is an exception. My daughter uses it for a combo dance/tumbling class, and it works perfectly. My daughter is tall and thin for her age and is between a 5 and 6 in clothing. I ordered the S(6x-7). There is room to grow, but the leo is certainly not big on her. My daughter is a slim size 8 in normal clothes and has a slightly long torso. We ordered a 12 b/c I wash them in warm water (and hang dry). Fits great for a slender build and looks terrific -- classic styling and good fit. Would definitely purchase again - we are pleased! Currently, this is best fit for my dancer! She's a slim 8 and wears a M. It must be a growth thing, but recently with her camisole leotard the straps started falling off her shoulders, or riding down in the front which was very embarrassing for her. We own 2 of these gathered tanks and love them! Nice soft cotton. I ordered a M(8-10) for my daughter who's a slim 10. Nice fit but no room for growth. Consider one size up. There are currently no questions about this style. Ask a question. We're sorry this item is temporarily out of stock. Would you like to order it anyway?